During its Nintendo Direct online event on Wednesday afternoon, Nintendo announced the classic N64 game “The Legend Of Zelda: Majora’s Mask” will be remade on the Nintendo 3DS, the company’s 3D handheld console. For those unfamiliar with the game, “Majora’s Mask” was by far one of the darker “Zelda” games ever created by Nintendo. 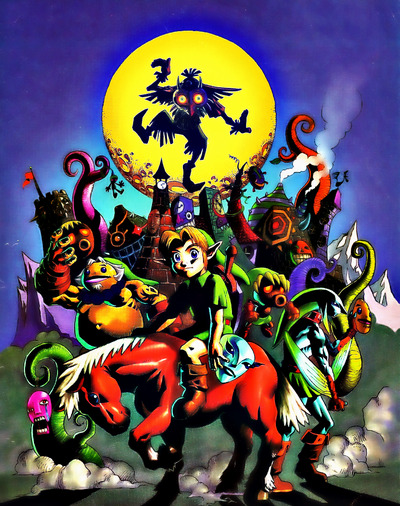 Released in 2000, the story revolves around Link, the hero from the franchise, as he attempts to stop the moon from crashing into his planet in three days’ time. To prevent the catastrophe, players must continually send Link back in time to the beginning of the three-day period, complete quests and figure out how to stop the world’s destruction before time runs out. Nintendo previously remade another “Zelda” classic from the N64 back in 2011, “The Legend Of Zelda: Ocarina Of Time.” “Majora’s Mask” is the direct follow-up to that game. The new version of “The Legend Of Zelda: Majora’s Mask” will be available for the Nintendo 3DS sometime in the spring, according to Iwata. Check out the trailer below.